It was on wheels which always threw anyone for a loop who happened to lean on it. And it wasn't very large. I wanted space. Wide open spaces. And stools for the kids to sit and have their breakfast or do their homework and what not. 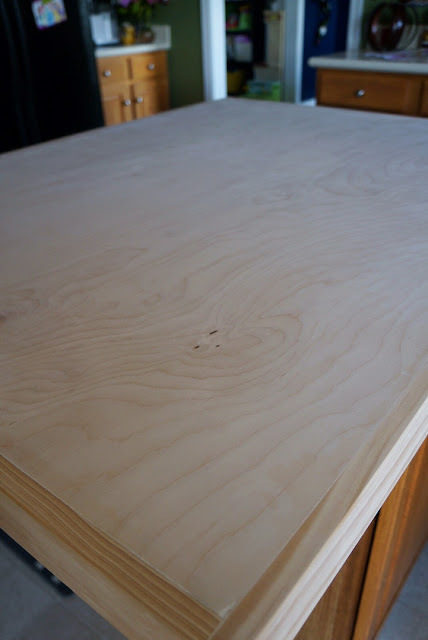 I took a sheet of sanded birch plywood and cut it down to the size we needed. I attached 1x3" trim pieces to the ends to make a lip. I then used a stain and poly combo to save some time at the end. 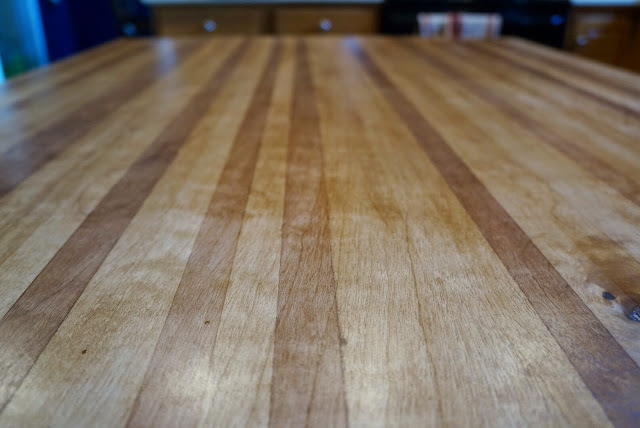 I stained the entire countertop and allowed it to dry over night. I then used masking tape (or painters tape if you happen to have some but we are fresh out) to give it a faux butcher block look and kept taping it off and staining until I had multiple layers of stain. After that I coated it all again with a layer of stain/poly. I used liquid nails to attach it to the old countertop and screwed it from the bottom as well. And the wheels are no more. Me again. The stools are a Target find ($15!) and I just spray painted the hades out of them. Three cans. I kid you not. And I could probably still spray some more. Such a pain painting stools I'll tell you. But here it is in all it's faux butcher block glory. Not too bad for under say... $70. And it's huuuuge. And I love it. This looks beautiful. 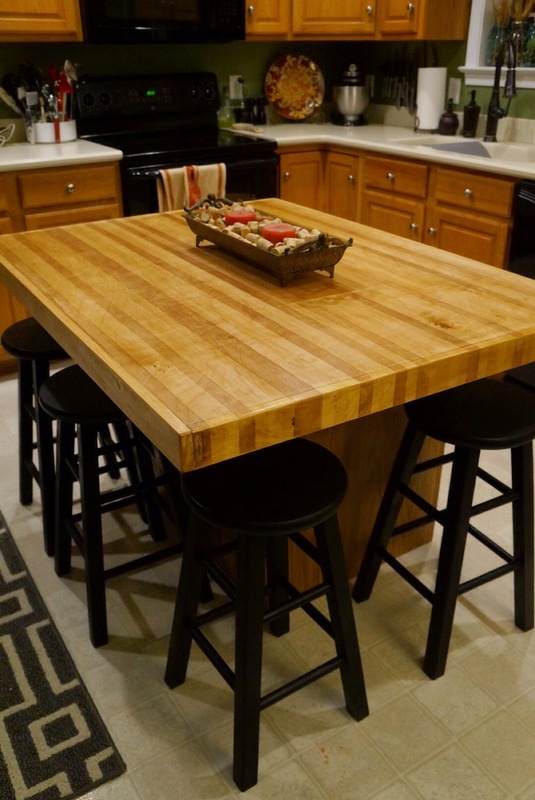 One of my fav things about a kitchen is an eat-in area... perfect at your island/stool area. Great job Matt! Tape! Clever! Who woulda thunk! It looks majestic. And hooray for not rolling away when leaned upon. This is awesome, I love it!!! You guys are blowin me away with your diy-ness! This came out great!! Love this!!! Wow I need to get me one of those Matty's!! This turned out so well! Looks awesome! OMG GIRL! This is so fab!! (and yes, totally stalking you..can't sleep!) I was seriously debating butcher block in our kitchen but Nick was against it.. it looks so great! You are so awesome! 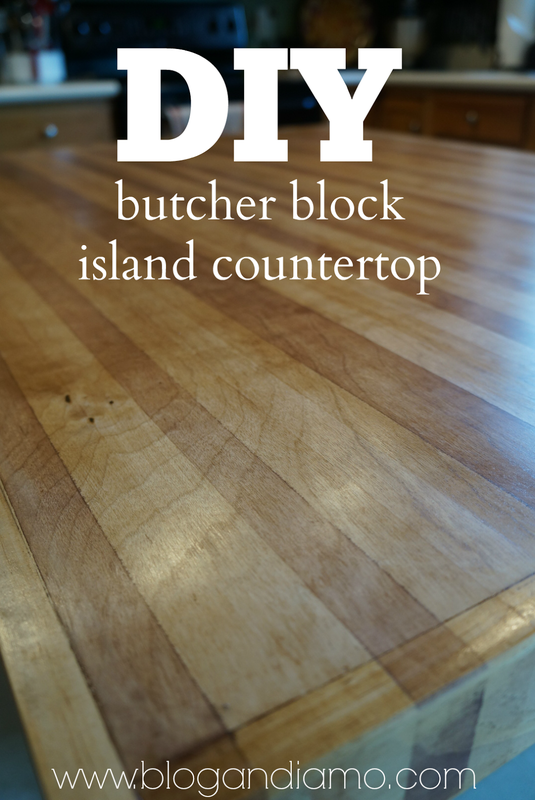 I love the way you cheated the look of butcher block! I really want to redo my counter tops in butcher block. how did you guys attach the lips to the edges? Yes we did we used 1x3 inch pieces to make a lip. It’s been almost four years and it still looks great! a day in the life, september edition. simple yet delicious and moist coffee cake. how you spell desperation. a tale of trains. glittered acorns. a fall diy failure. the nursery. before and after. a fall potpourri. with apples! the apples called. we answered. things about a friday with a floridian. and that's how chips are made little jimmy. and off young lady. into the great wide world. fall bucket list. the 2014 version.